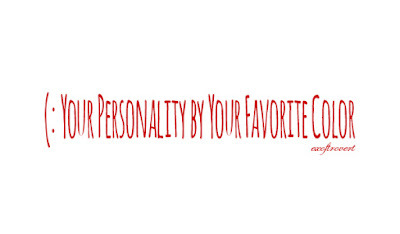 Your Personality by Your Favorite Color - Personality can be seen from the details associated with a person, such as food, beverages, or favorite color. Analysis to determine the color of a person's personality has long been used, because its true color is very influential in the world for human life. The brown color enthusiasts and have a good stamina. They are impatient, opinionated powerful, and easy introspection. Therefore unreliable chocolate connoisseurs. But they are not very articulate and tactless, but it is preferred if given the responsibility and will seek to discharge that responsibility as well as possible. Grey is the epitome of prudence and compromise. They are people who are diligent, talented in the business, and willing to work hard without reward. They just need the peace and tranquility in their lives. People who love this color usually are fond of creating a sense of mystery to others around them. Their mindset is hard to guess, because it is not visible from the outside their appearance. This color is synonymous with youth and purity. If you are an adult who likes the color white, then it signifies perfectionism. have standards that are too high to everything. But there are times when people -people who love white color like everything was simple. Red symbolizes strength, health and vitality. 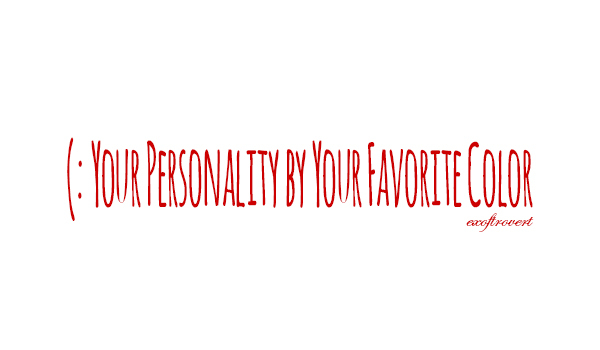 These colors are usually preferred by those who have personality open, aggressive, impulsive, and passionate. The red color symbolizes the success in the face of life's trials. A red heart is the color of mature people since the forging of life. People who make a maroon as his favorite color have a high discipline as well as people who like the color red. Orange symbolizes the luxury and pleasure. People who love the color orange usually pleasant personality and stand out. They are very fond of social interaction. People with private orange youthful, fearless, full of curiosity, and not easily tired. This soft red type representing aspects of softness also in personality. Pink symbolizes love and genuine affection. People who like this color usually has a motherly attitude. That's why most of those who like pink are women. Yellow is the color of happiness, wisdom and imagination. The yellow color is usually chosen by people who thirst for adventure, love new things and self-actualization. Yellow also represents intellect and all things related to the mind. That's why people who like the color yellow is usually clever, talented in the business, and have a good sense of humor. This color symbolizes prudence, conservatism, and introspection. People who like blue are usually patient, sensitive, have good self-control, and easily realized his mistake. Turquoise usually have private complex. They have high imagination and original thinking. Green symbolizes harmony and balance, representing hope and peace. These colors are usually preferred by those who are gentle and honest personality. They do not like to look for and solving problems through violence. They are too focused with myself to not be aware of things happening around them, and they tend to not like to work hard. They have a creative soul, the nature of polite, pleasant and playful.